>From the 19th to the 26th November I attended a writing retreat at the TaraLoka Women’s Retreat Centre near the north border of Wales, about an hour from Manchester. 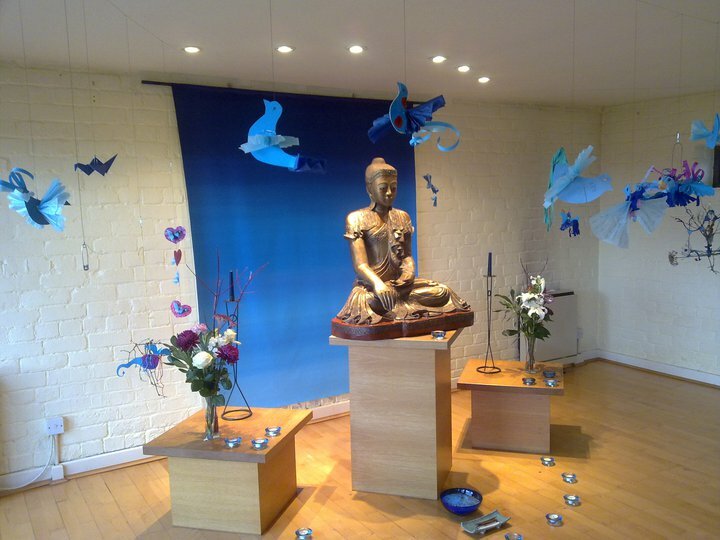 Having been on team retreats with Buddhafield, and a 10 day silent meditation course at the Vipassana Dharma Dhippa centre, experiences at either end of the spectrum – Team Retreats being quite relaxed, while Vipassana was very disciplined – I wasn’t sure what to expect. The retreat was led by Samantabhadhri, who lives at TaraLoka full time, Kavyasiddhi, a writer whose plays are often heard on Radio 4, and Mumukshu, who I live and work with in the Buddhafield Café. This review just scrapes the surface of my experience at TaraLoka, so many things happened which were truly wonderful, that there is no way I could write them all down. This is just an attempt to share my experience. TaraLoka is a beautiful retreat centre on the Welsh/Shropshire boarder. In 1985, an old farm and its surrounding land was bought and gradually, a team of women converted it into the beautiful centre that is there today. There is a white community house a way away from the retreat centre in which the retreat team live. The retreat centre itself consists of two buildings, one which contains the shrine room on the ground floor, and above that bedrooms, and the other contains the kitchen, dining room, living room, art room, more bedrooms and a solitary retreat suite. There is a sense of light and space throughout the centre, the room are painted bright colours, there are warm wooden floors and the kitchen is a delight! I wish we had one that size and that well equipped for Trevince! Retreatants all sit together to eat in the large dining room, and there are enough sofas for everyone in the cosy living room. There is a burner at one end which provides a really nice focal point, and we gathered round it every evening for different activities. The centre is surrounded by beautiful gardens which are seen through the windows that seem to be everywhere you look. I feel very privileged to have been there at the time I was, as over the week I was able to watch the change from autumn into winter – the first few days there was no frost, the sun was still really warm and I wandered around outside with no coat. On the third morning I woke to find the world white and silent, the grass was stiff under my feet as I walked to the Tara cabin for morning meditation, and my breath emerged as white smoke. 7am. I am woken up by another of the retreatants, Chloe, ringing a bell, outside my door which is above the shrine room. It is still dark so I and the other occupants of my room, slowly and sleepily dress and bumble downstairs, across the walkway, stopping to marvel at the stars that are still out, and into the warm dining room. There I make a cup of tea and sit on a sofa , slowly becoming fully coherent, while other retreatants do the same. Apart from the first morning, we are in silence until the first activity at 11am. I enjoy it, it gives me space to start the day and slowly come back to myself, without feeling guilty for ignoring others. 7.30am Morning meditation. I join the beginners meditation, led by Mumukshu, in the Tara Cabin, a small wooden panelled cabin in the grounds of the retreat centre. There is a beautiful shrine, and full length windows that look out onto fields with sheep and woodland. It is so cold that I run and leap across from the house to the cabin in an attempt to preserve my warmth, my feet leaving darker patches in the frozen grass. The other beginners and I leave our shoes outside, exchanging glances that say ‘Isn’t it cold today!’. Once in, we start the session by doing a quick warm up, tapping our bodies all over and shaking ourselves out to get the blood flowing. We sit, and Mumukshu talks about the day’s meditation, we do Mindfulness of Breathing and Metta Bhavana on alternate days. After spending about 40 minutes meditating we each talk about how the meditation went for us, and Mumukshu offers advice and suggestions. It is really good to speak to other beginners about their experiences and realise that I am not the only one to have the problems I do in meditation! About 8.45 we stop, silence resumes and we go back over to the main house. The sun has fully risen by now, and I, full of energy and joy at my beautiful surroundings, cartwheel back over to the house, to the amusement of the people looking out of windows at the right moment. 9.15am. Breakfast! Porridge is made each morning by a retreatant. For the week that we are on retreat we live as a community, meaning each of us signs up for a job every day to help keep the centre running. There is a volunteer cook, Kathy, who makes lovely food all week, but other jobs like cleaning, setting tables, washing up and making breakfast are our responsibility. People take these tasks on with joy, I am offered toast in silence with wide smiles and glints of laughter, and from the washing up area after lunch and dinner peals of laughter ring out. We are in silence until 11am when the writing workshop starts. I love this hour of silence, when people wander from room to room, looking at books, writing, or just sitting. It is so peaceful. 11am. We all gather, pens and paper in hand, in the living room, where Kavyasiddhi sits on a chair, ready to tease out of us gems of poems and stories that we didn’t know were hidden inside us. The workshops consist of a number of timed writing exercises, in response to a title or phrase given, a walk outside, or a picture or set of words we choose from a random selection provided by Kavyasiddhi. At first she says we aren’t going to share, which makes it a lot easier to write, I’ve never shared my writing with anyone before, and it was this aspect of the retreat that I was most worried about. Kavyasiddhi works us into it slowly, only asking for volunteers to share after a few preliminary exercises. At the start only a few of us share, reading out in small voices, heads buried in our papers, but by the end of the week we are all sharing our work, heads up, smiling round at the group that has held us all through the experience. We write on a wide variety of different subjects, yet the thing that surprises me is that, even if while writing I don’t think I’m writing about myself, when I read it back, I see exploration and sometimes resolution, of issues or ideas or problems I have been thinking about. 1.15pm. Lunch is served, and we sit round the dining tables discussing the writing session, our respective lives outside the centre and a myriad of things in between. Everyone is so open and honest, understanding and supportive. After lunch we have free time until group meetings later on. Now is when closer relationships within the group are formed. The writing sessions and the openness within them serve to cement us as a group, but it is the walks together round the site, the washing up sessions that take all afternoon, the cups of tea shared on a sofa, the secret discovery of biscuits in a tin in the cupboard, that create closer bonds of friendships that will last beyond this retreat. 4.30pm. We each have signed up for one of three groups, each led by a retreat leader. I am in Samantabhadhri’s group, along with Linda, Helen, Janine and Amitashuri. It is a mix of people I know and don‘t know: Amitrashuri was a shift co-ordinator in the pancake tent at Buddhafield Festival 2010, as was I, and Janine worked on my shift at my first Buddhafield festival in 2009. It was a surprise to see her here, we became close at Buddhafield 2009, and then I got off the train at Whitstable to find her in the same taxi as me – what a lovely surprise! It really brought home to me how much everything has changed for me – when I first met her I was very unhappy, working a job I didn’t like, full of worry, closed up and wanting to change but not knowing how. In contrast, in the year and a half since I met her I’ve completely transformed my life and myself and am happier that I ever thought I could be. In our group we use the time to have an extended check in. A check in is where you sit in a circle, and, after a few minutes of silence, go round the circle, each person saying a little bit about how they are feeling, what has gone on for them that day, if they have any problems that they would like to express, or anything they would like to rejoice in. Each morning at Trevince we do this, and it is a really useful tool when living in a community, it helps you act more compassionately towards yourself and others, and brings you closer together as a group. I really enjoyed our group, it was smaller than the others and I felt this helped us have a really safe, held space. I felt truly listened to and understood. I am really grateful for the people in the group, for their strength and willingness to listen and accept everything each of us said. It was a really powerful experience for me. 6.30pm. Dinner is served, and again, people sit around after chatting and laughing. 7.45pm. Each night is something different: a couple of sessions consist of us sharing inspiring poetry that we or other have written, and in other sessions each retreat leader speaks. Mumukshu introduces a poem by Charles Bukowski called bluebird, which is about creativity, and suggests that we all use the art room to make a bluebird to use in the closing ritual at the end of the week. Kavyasiddhi tells us how she got into writing, and speaks compellingly about ‘the thread’ that is the path that we follow, that might be unknown and scary but that we can’t help following because we know it’s right. This really resonates with me, I feel really strongly that Buddhafield and Buddhism is my thread, I’ve never felt a pull this strong towards anything, and it has been something I’ve thought a lot about this summer. It’s good to hear someone else talking about it. Samantabhadhri also talks about her relationship with words, speaking about her ambitions to be a writer and sharing some of her writing with us. 8.30pm. Puja time! Having been brought up a Jehovah‘s Witness, and being told from a very early age that worshipping an image and participating in ritual is completely utterly wrong, and something which will stop you from living forever in paradise on earth, I’ve had quite a struggle to be able to join in puja’s and appreciate them. It’s something I still struggle with. I’ve done very few puja’s before now, and never a seven fold puja every night for a week! It’s a very emotional experience for me, especially when I watch people making offerings, and recite the admittance of faults. The shrine space is really striking, and I felt a connection with the rupa, which I really enjoyed and was grateful for. Something clicked in my head to make it all make sense to me. I realised that the image of the Buddha is not an idol, we are not worshipping the image itself, which is what Jehovah’s Witnesses prohibit, but what it symbolises. It is symbolic of a state to aspire to. I look at the rupa and see someone to look up to, as I would look up to my parents, or a teacher, or someone I respect, I see someone who has set an example that I can strive to follow and be like. It’s so hard to put this all into words! Hearing 30 or so women all chanting together, and listening to the Heart Sutra being recited was very moving and really affected me, each night it reduced me to tears. After the puja we went into silence over night. This was so good for me too, each puja had such an effect me that I wasn’t really capable of talking, I just needed to be alone with my thoughts, and feel the space inside me that the puja helped create. On the last night as part of the closing ritual we all gave the blue birds we had made as offerings to the shrine, hanging them from a line draped across the shrine space. It was truly amazing to see this solid symbol of all our efforts to release our inner creativity and to use that in way to benefit ourselves and others. On the last morning, we all meditated together in the shrine room, doing a group Metta Bhavana. This was possibly the most intense experience of the retreat for me. We sat and did the first stage, and then, in turn Samantabhadhri, who led the meditation side of the retreat, named us all in turn, and as each person was named we concentrated our Metta on them. Going into it I felt quite blasé about it, I didn’t think that I would feel much as I find Metta Bhavana the hardest practise, but I really did! I felt so much love and warmth from everyone in the room, it really moved me. Afterwards I felt like Tigger! I had so much energy and love that I literally had to bounce around and do cartwheels to express it. I was sorry to leave, and to see the group of women who I felt such a connection with disperse, but I guess it’s another lesson in being able to let things go, and understanding that I can’t hold onto things because they will always fade and change. I came away from the retreat feeling renewed and refreshed and even more sure that following this thread is what I must, and will continue to do. I’d like to thank Buddhafield for this chance to go on retreat, there is no way I could have gone on it without their help. I’d also like to thank Abbie for pointing it out to me and persuading me to go after I saw that I’d have to share my writing and immediately ran away from it! I’d like to thank Rosie and Mumukshu for being there with me and last but not least, I’d like to thank all the wonderful amazing women who were part of the retreat – big sardu to you all guys!! This entry was posted in Buddhism, growth, Love, Puja, Retreats by TaraGreen. Bookmark the permalink. It was a wonderful experience for me too – my first retreat but not my last by any means! And yes, I also found the Pujas very moving and the company of all the women throughout the week was so comforting. An unforgettable week for me – thankyou for putting it into words. Many thanks – a lovely piece of writing in itself! I have been on a number of retreats at Taraloka and enjoyed all of them. This last one stands out as one of the most memorable, for the fulfilling mix of creative writing and meditation, for the excellent leadership and for the metta flowing between everyone throughout the week. I hope to meet at least some of you again. And I also hope to visit Buddhafield!